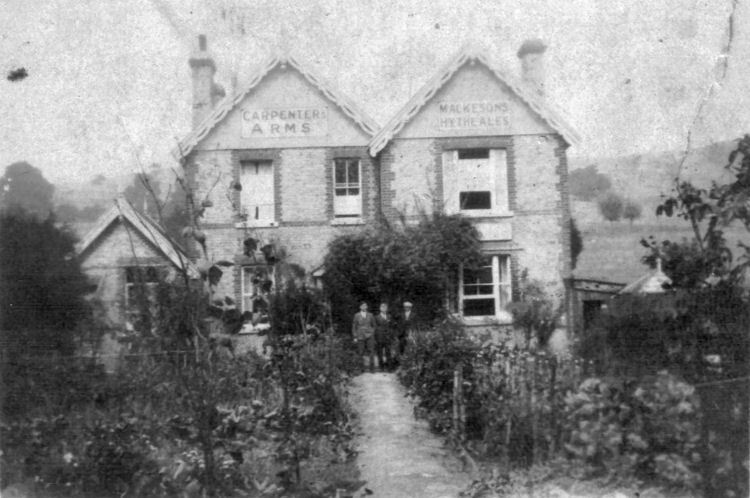 Jim Green recently sent me this photo, saying that it was taken by his father around about 1930, but as to which "Carpenter's Arms" it is, I am so far at a loss to the location. He goes on to say:- Another photo which came with it shows the trippers on a rowing boat; I presume on the Royal Military Canal. As the Mackeson Brewery was at Hythe, perhaps this "Carpenter's Arms" was thereabouts. He also had relatives at nearby Saltwood. My father was born in 1908 which is why I date the photo at about 1930 or perhaps a few years before. From an email received 26 October 2014. I'm fairly sure that your latest "unknown" is the "Carpenters Arms," West Hythe. You've got it (as far as I remember) listed among the Hythe section, but West Hythe is along where Botolph`s Bridge is. I've come across many references to it while doing my bits in the library, but I've never been entirely sure where it was, and no amount of Googling gave me any indication. It features on my site in an inquest into a landlord from the "Swan," Dover Road, who committed suicide in 1912.